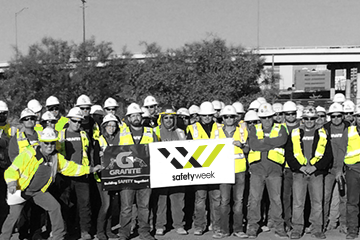 New York Construction Safety Week will take place from May 6 to 10 2019. During this yearly awareness campaign staff members from the New York City Department of Buildings visit construction sites and promote safety. The week ends with the Build Safe, Live Safe Conference. The subject of the multilingual campaign is “Experience is not Enough”. The campaign promotes the use of safety equipment especially fall protection. No matter how experienced a construction worker is or how many years he spent in his job, he should always use fall protection. Fall is the number one cause of fatalities in construction sites in New York and in the US. Employers are responsible to provide a safe work environment and prevent workers from falling. Leading edge and floor openings must be protected by guardrails, cable, netting, solid barrier or solid planking. If workers are performing tasks near an unprotected open floor, leading edge or shaft, they are required to wear a safety harness that is proprely connected to an approved anchor point. The campaign will also promote the safe usage of extension cords and the prevention of tripping hazards. Additionally, DOB staff members will provide tips on how to keep a construction site clean and ordered to prevent accidents. Construction workers will also be briefed on how to keep the public safe when walking near a construction site. On Friday the Build Safe, Live Safe Conference will consist of several presentations during which speakers will discuss new construction trends and focus on safe building. This year participants will learn about structural condition assessment, protection of tenants in buildings occupied during construction, facade failure in high rise buildings, elevators requirements, new codes requirements in regards to construction safety, crane and derricks codes and regulation and changes to come in regards to the NYC Energy code. Participants will also be introduced to an upcoming basement apartment pilot program and learn how to deal with large electrical equipment design.